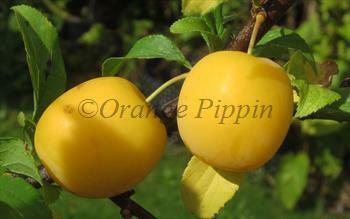 As the name suggests this modern cherry plum variety features golden yellow spherical fruit. They make a pretty sight as they ripen on the tree in late August. The flesh is a translucent yellow, and has a mild sweet plum-like flavour, with a hint of sharpness. It can be eaten fresh but like all cherry plums it is primarily for use in the kitchen. The small stone clings to the flesh but is quite easy to remove. Golden Sphere® is a protected variety. Please fill in the details below and we will let you know when Golden Sphere mirabelle trees are back in stock. late August / early September? Golden Sphere is in flowering group 1. Golden Sphere is partially self-fertile, but fruiting will be improved if there is a compatible tree of a different variety nearby. 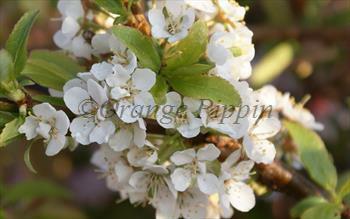 Golden Sphere is a new cherry plum variety, developed for the lower temperatures and light levels of northern Europe. As well as the pollination partners mentioned above, Golden Sphere will also cross-pollinate with most early-flowering Plum and Damson varieties. Golden Sphere produces a compact but spreading tree, typically wider than it is tall.